Collards. Kale. Spinach. Swiss chard. The greens are coming, the greens are coming! They're in season, and they'll soon be at a market near you, or coming to you in droves via your CSA. But, if you’re like most people, you might be wondering, “What do I actually DO with them?” and more specifically, “What can I make with them that my kids will actually eat?" Read on for reasons why you should be eating these tasty greens and how to prepare them. Then get out to the local farmer's market (or your backyard garden), and buy some greens - even the ones you normally wouldn't try! The brightly colored stalks are sure to grab your attention while walking through the farmer’s market, and you’ll be rewarded if you buy them – swiss chard is high in vitamin A and C, and rich in fiber and iron. For a tasty brunch or dinner dish, consider making this swiss chard quiche from VegNews: the swiss chard can be chopped very finely and is well-seasoned. 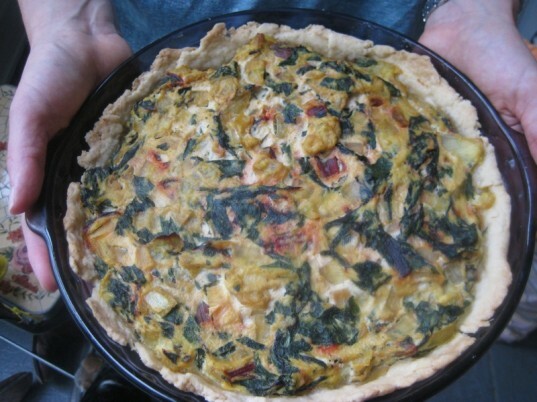 Kids will love the yummy crust and tofu filling, which complements the chard flavor well. We also like to slice the chard into thin ribbons, crosswise and sauté it with balsamic vinegar (even throwing in some raisins on occasion to add a little sweetness). Collard leaves look like big beautiful green fans, and their size and shape make them useful in many different types of cuisine. They also contain vitamin C and lots of fiber, and are currently being studied as a food that has cancer-preventing properties. The only downside? Collards can have a bitter taste. 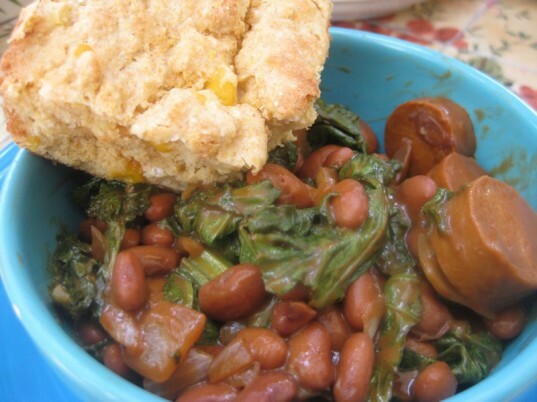 However, collards don’t need to be cooked in butter and sautéed into oblivion in order to become a part of your diet. One option is to steam them for about 2 minutes (until bright green and slightly softened) and use them where you could a tortilla or spring roll wrapper. 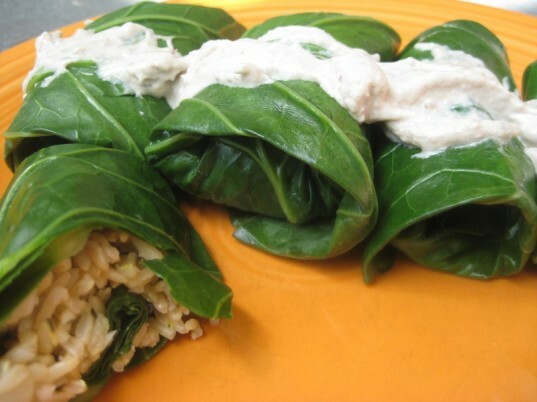 Our other favorite use for collard greens is to make a version of dolmades (grape leaves stuffed with rice), using collards instead of grape leaves. Be sure you cut out the thick tough part of the stem though. Choosing Raw has a great tutorial for how to prepare collards for use in raw wraps, and we use that method even when steaming or blanching them. Weelicious also has a unique collard juice recipe. Spinach is one of the more well-known greens and has a wonderful mild flavor that can either be accentuated or played down. So toss a cup or two into smoothies (we promise no one will be able to taste a difference) or blend some spinach into a vegan alfredo or cream sauce – you’ll get a side of folic acid, calcium, iron, and vitamins as well. We almost always add some sautéed or steamed spinach into the layers of our lasagna, and sometimes we also add some of spinach’s buddies kale or chard as well. Sticking some spinach into wraps or quesadillas is also a tasty addition. Kale has been hot stuff in the culinary world the past year or so and no wonder: it’s high in a variety of vitamins, contains calcium, and is just plain delicious. A popular ingredient in green juices and smoothies, kale is beloved in recipes around the world and comes in several varieties (lacinato and dinosaur). We like to add some kale with other vegetables into tomato sauce over whole wheat pasta; the sweetness of the tomatoes is a good match for the kale. 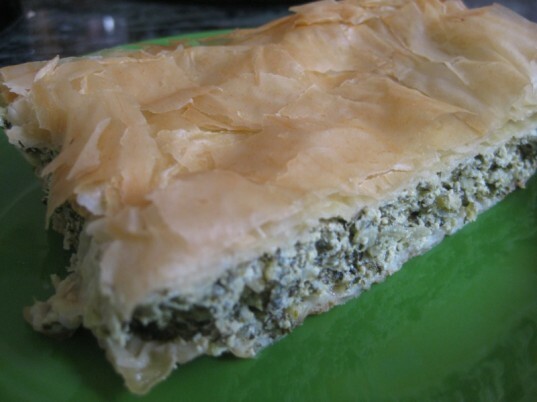 Kale can also replace spinach in the Greek dish spanakopita. Mustard greens were new to our family up until recently. And what we’ve been missing – in addition to the vitamins (A, C, and K, as well as folate and manganese), is the unexpected flavor and spicy kick from these greens. Sautéing them with onions, beans and veggie frankfurters in a homemade barbecue sauce and then serving it all with fresh cornbread, the mustard greens were an unexpected hit with my crew. The next day I added the leftovers in the mustard green bunch with some veggies and made an impromptu (and slightly sinus-clearing) miso soup! Yum! Turns out those weedy leaves around our favorite childhood flower are actually packed with fiber and potassium and are even known to be anti-inflammatory. Dandelion greens are often served in salads, sautéed simply or added to soups. 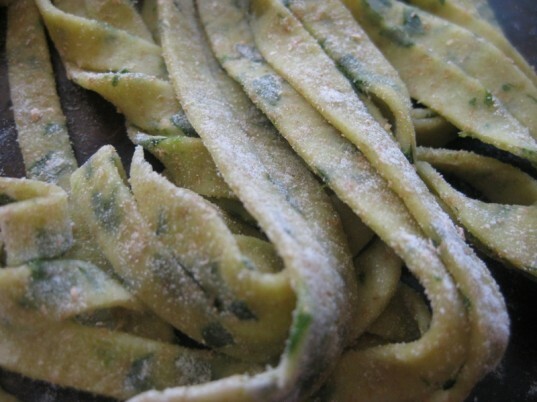 To make them more kid-friendly, try out some of the recipes, including one for dandelion green pasta, from this online cookbook from the Alaska Exotic Plant Management Team.Happy cooking! The brightly colored stalks are sure to grab your attention while walking through the farmer’s market, and you’ll be rewarded if you buy them - swiss chard is high in vitamin A and C, and rich in fiber and iron. For a tasty brunch or dinner dish, consider making this swiss chard quiche from VegNews: the swiss chard can be chopped very finely and is well-seasoned. 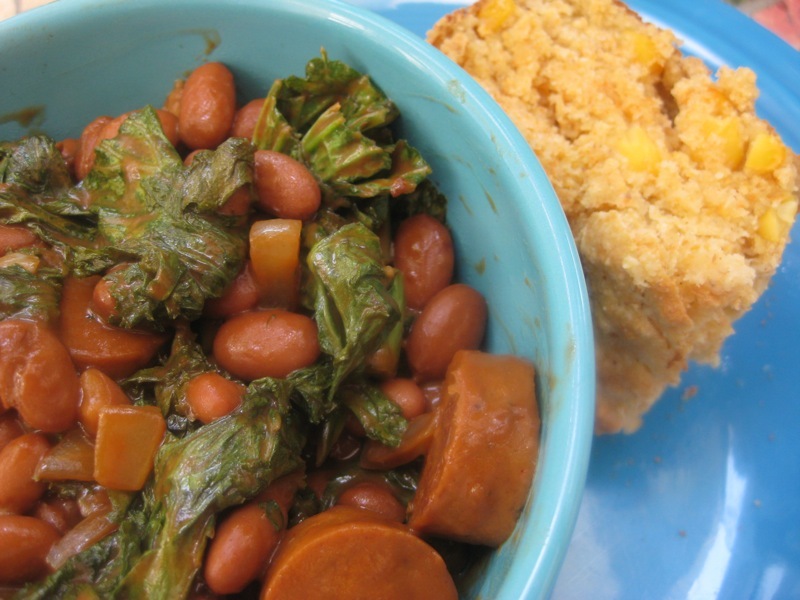 Kids will love the yummy crust and tofu filling, which complements the chard flavor well. We also like to slice the chard into thin ribbons, crosswise and sauté it with balsamic vinegar (even throwing in some raisins on occasion to add a little sweetness). Spinach is one of the more well-known greens and has a wonderful mild flavor that can either be accentuated or played down. So toss a cup or two into smoothies (we promise no one will be able to taste a difference) or blend some spinach into a vegan alfredo or cream sauce - you’ll get a side of folic acid, calcium, iron, and vitamins as well. We almost always add some sautéed or steamed spinach into the layers of our lasagna, and sometimes we also add some of spinach’s buddies kale or chard as well. Sticking some spinach into wraps or quesadillas is also a tasty addition. Mustard greens were new to our family up until recently. And what we’ve been missing - in addition to the vitamins (A, C, and K, as well as folate and manganese), is the unexpected flavor and spicy kick from these greens. Sautéing them with onions, beans and veggie frankfurters in a homemade barbecue sauce and then serving it all with fresh cornbread, the mustard greens were an unexpected hit with my crew. The next day I added the leftovers in the mustard green bunch with some veggies and made an impromptu (and slightly sinus-clearing) miso soup! Yum! Turns out those weedy leaves around our favorite childhood flower are actually packed with fiber and potassium and are even known to be anti-inflammatory. Dandelion greens are often served in salads, sautéed simply or added to soups. 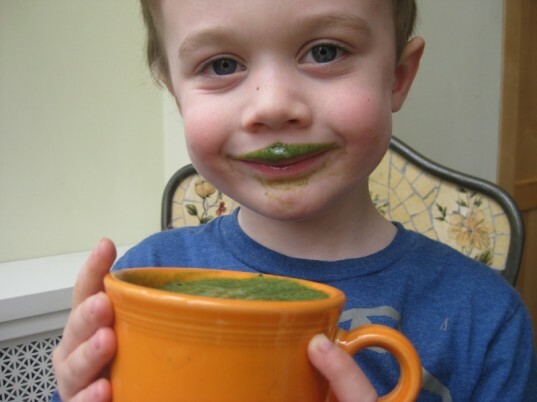 To make them more kid-friendly, try out some of the recipes, including one for dandelion green pasta, from this online cookbook from the Alaska Exotic Plant Management Team. Happy cooking!